Between the ages of 45 and 55, women stop ovulating or releasing eggs monthly due to a decreasing number of eggs. At this stage of life, her body begins to produce less estrogen and as result, a gradual or sudden end to the menstrual cycle. This phenomenon is called menopause. The menopause experience can be a challenging one, but it doesn’t have to be faced alone. Although menopause is considered a natural stage of life rather than a medical condition, women can still turn to their health care professionals for help in coping with symptoms of menopause. Hormone therapy can be used to treat symptoms such as hot flashes, night sweats, mood swings, and vaginal dryness. The process involves increasing the body’s estrogen levels through the use of oral medications, patches, or vaginal creams. As women hit middle age, they become infertile and no longer menstruate. This is known as menopause. 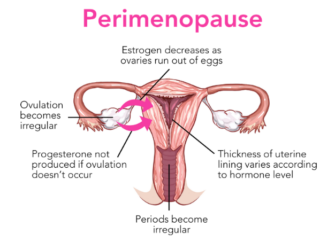 Perimenopause refers to the time before menopause begins – it literally translates to “around menopause.” Due to fluctuating hormones, perimenopause causes significant symptoms that can affect quality of life. Today, there are more treatments than ever to mitigate the side effects and symptoms of perimenopause. There is no cure for perimenopause, as it is a natural part of the life cycle. However, treatments exist to reduce and mitigate its symptoms. Treatment for perimenopause can begin with a hormone level test to determine if estrogen or progesterone levels are currently imbalanced. Once hormonal imbalance has been diagnosed, there are several treatment options.